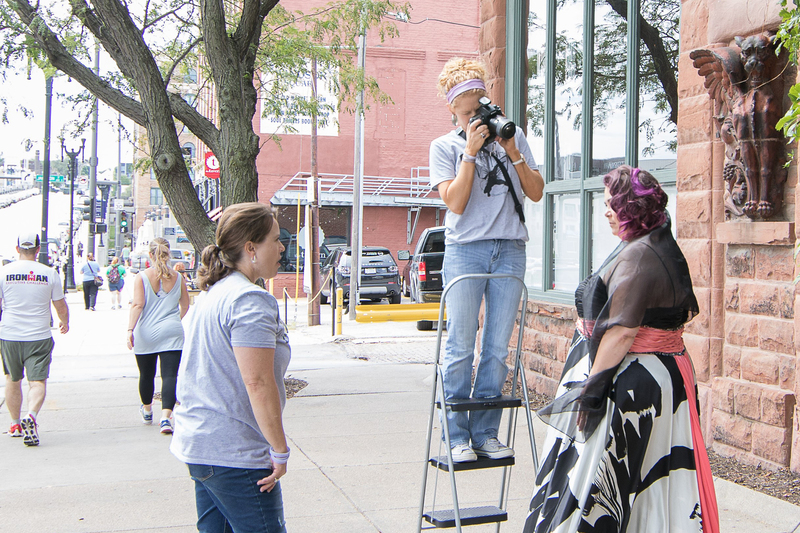 Rhonda Brunson '00 photographs a subject for The Choose Courage Foundation. The Choose Courage Foundation, a non-profit run by Brunson, seeks to grow awareness surrounding domestic violence. Teacher, artist, and photographer Rhonda (Golwitzer) Brunson’s education, experiences, and leadership opportunities at Wayne State College prepared her well for diverse paths after graduation. Brunson, who lives in Crowley, Texas, graduated from WSC in 2000 with a bachelor’s degree in Secondary Education with subject endorsements in French and Physical Education. Meeting the high expectations of teachers, serving as a resident assistant, and participating in clubs at WSC gave Brunson the lessons and trials she needed to be successful. Brunson used the practical and real-world preparation from her education degree right away as a high school French teacher for seven years. She enjoyed the challenges of being an educator and influencing the next generation. Her path took a more creative turn when she opened a photography studio in 2007. Running a business, growing as an artist, and balancing the excitement of being a new mom kept her on her toes and allowed her to continue to evolve as a person, which led to a photography project: photographing survivors of domestic violence so they could see their amazing beauty. What started as a one-time concept morphed into a charity art show celebrating 12 survivors of domestic violence from the Dallas-Fort Worth area. Following the show, Brunson formed a national non-profit, The Choose Courage Foundation, which has become a passionate pursuit to make a difference. Brunson serves as the foundation’s CEO. The primary mission of The Choose Courage Foundation is to grow awareness surrounding domestic violence. Brunson’s recent photoshoot of 14 survivors in Omaha was used in a social media campaign during Domestic Violence Awareness Month. It reached over a half million people, was covered by three news stations, and included the support of 40 businesses. For more information about The Choose Courage Foundation, visit www.choosecourage.org.